The second year of the project started its first phase of training on 19thJune 2018. This training season is divided into two parts; June run by UCL and KCL and the following September by Durham University. The two-week training in June 2018 was structured as follows: Week 1 (19th-23rdJune) about documentation using photogrammetry methods run by UCL, and Week 2 (24th-30thJune) about heritage management and public engagement by KCL. 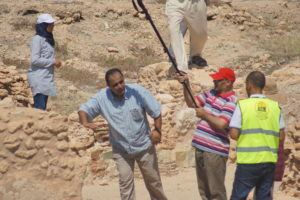 The training began with the photogrammetric documentation of archaeological objects in the Musée archéologique de Sfax and then gradually moved to documentation of archaeological features and entire sites in Iunca and Thyna. Although not directly under threat of immediate destruction, these sites had significant fragilities and those were used to focus the discussions on longer-term monitoring, conservation and vision of management. 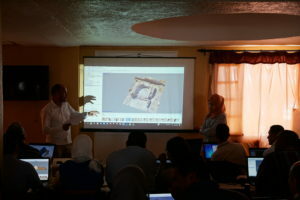 The use of recent and inexpensive technologies in photogrammetry were used to demonstrate the possibilities and the participants were shown how to implement it widely in their areas of work with the equipment they had (ranging from mobile phones to Digital SLRs). Eight facilitators were also involved in June 2018 training in order to help with the hands-on elements of the training. These are Tunisian (5) and Libyan (3) specialists who worked with the project over the last 12 months and participated on advanced trainings. Documentation exercises were combined with classroom sessions and individual work with every participant. Rapid documentation through photogrammetric means went hand in hand with processing of the data and extracting meaningful outputs that can be used in heritage management plans, site monitoring and condition assessment, and site presentation and public engagement. Throughout, every effort was made to present the main focus area – Photogrammetry – as part of the wider field of detailed documentation. Its benefits as well as its challenges were discussed openly and the participants had a chance to experiment with the methods. 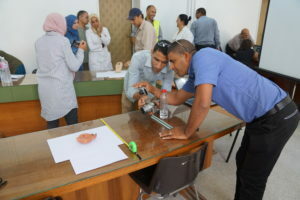 In general, all project staff from all three universities aimed to make sure that the participants kept the bigger picture in mind whilst focusing on specific recording or surveying techniques. In addition, to address participants comments from the 2017 training session, particular emphasis was made on integrating the outputs into GIS component, and on integrating the technical outputs with the condition assessment work in the second week. The participants of the training gathered in the training venue on the 19th June. Although some discussions took place with early arrivals on the 18th June, 19th June was a full start of the training. The day started with an introduction that elucidated the concept and aims of the project, its main components, staff members involved, and collaborative nature of the works that involve three UK universities and two national heritage authorities. The achievements of the project from the first 12 months were also highlighted as part of the introduction. The introduction was followed by presentations from facilitators. Two presentations highlighted the achievements of the mini-projects in detail and showed the direct benefits of the Training in Action project in Tunisian and Libyan context. The discussions that followed showed the impression these presentations made on new trainees and inspired them to learn from the project in the coming days. Libyan specialists Ahmad Masoud and Mahmoud Hadia presenting the results of their mini-projects. After preparing the participants laptops with softwares and manuals the training of the second year of the project started. The participants were introduced to object photogrammetry through specific, pre-prepared, collection of images. The group became familiar with the basics of the software packages for photogrammetry. Most of the participants achieved good results with processing the datasets. 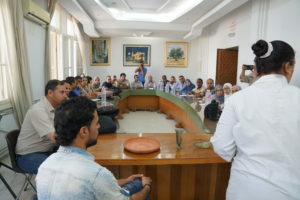 In coordination with INP representatives, particularly with Dr Ammar Othman, the group was taken to the Musée archéologique de Sfax where the curator, Dr Samira Arous kindly provided the group with some of the most outstanding pieces of their collection to be recorded. The participants were divided into the groups with an object assigned to document and the facilitators helped UCL team to manage the process. The exercise helped to learn the basic principles of taking the photographs, ensuring overlap and then processing quickly on the laptops. Lower resolution results were available almost immediately and the participants were encouraged to take pictures of more challenging objects. This session particularly stressed the potential of low-cost tools like cheap smart-phones to create high-quality 3D models. Initial introduction at Sfax museum. The groups were shown how to use the scales and targets to give precise measurements to the objects. Once this stage was successful and they were able to demonstrate their understanding of the basics, they were allowed to work with more complex objects. Participants learnt how to process the data in Photoscan using their own pictures and to create their lower-resolution models of objects to scale. The participants experimenting with different cameras at Sfax museum. The third day of the training (Thursday) was dedicated to working in an open-site conditions in Iunca. Because the entire fort is too complex to map with such a large group of beginners, the decision was made to focus on the internal northern wall with the aim of creating a detailed orthomosaic and digital elevation. The results had direct relevance for the works in the second week of the training. The trainees were divided into 8 groups that were arranged to do the complete documentation of the wall independently as a group. They used cameras in the ground level and remotely controlled, pole-attached cameras for documenting higher elevation. They were also introduced to machine-readable photogrammetric scales. Groups taking pictures with the use of the monopod at the Fort in Iunca. All of the groups managed to create a good model of the internal northern elevation. It was encouraging to see that all groups achieved highly detailed results, and the majority of the participants were able to create complete datasets, make measurements and calculation on their models. DEM of the northern wall of the fort of Iunca, produced by the participants. One of the participants showing the northern wall elevation and discussing it with the trainers and the group. 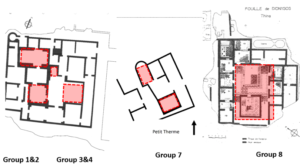 On the fourth day the participants were divided into groups and had to plan and conduct a photogrammetric survey of their own building complex at Thaenae (including several key areas such as Maison du Cheval, the Roman baths ‘Thermes de Mois’ or an excavated house) with limited assistance from the trainers- and direct contribution from the facilitators. The groups were given papers with specified areas to document clear marked before exercise. Site of Theane. The target areas were selected to highlight the potential of using photogrammetry to record and monitor archaeological areas facing more risks. For example, mosaic panels are still visible in extensive areas of the site and are visibly eroding at a swift rate. Recording them is challenging given the difficulties of capturing the colours accurately. Taking these challenges into account, the participants planned and executed their data collection exercises themselves and they achieved spectacularly high results that can be used by the site managers at Thyna. Trainees collecting images at the site of Thenae. The groups then learnt how to use 3D models to calculate site perimeters, the extent of certain features (e.g. buildings, pools, cisterns) and also to do volumetric calculations. During the afternoon session, all 8 groups presented their sections of the monument in several digital formats. Having at least one facilitator with each of the groups ensured that the process run smoothly. It was followed up by detailed discussion session. One of the groups presenting their model of the site of Theane. The main focus of the day 5 was ensuring that three elements of the wider training – photogrammetry, GIS, site management – were properly integrated and that the participants saw direct benefits of that integration. The hands-on session in the classroom firmed up the advanced processing skills in photogrammetric outputs and then presented them in GIS software. The basics of the concepts of digital attribute tables were presented with the aim of aiding condition assessment exercise in the next week of the training. 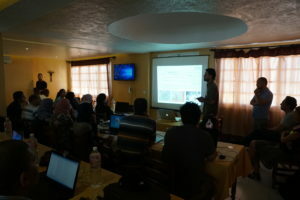 Since the main goal of the training was to equip participants with practical methods that are applicable in real-life scenarios with the use of open-source and easily available software packages, the focus was on QGIS (open-source) and other software for presenting and distributing the end results (Meshlab, Sketchfab, etc). The discussion highlighted the potential for publicising their work as part of the public engagement activities too. The afternoon of the day 6 was spent wrapping up the training and introducing aerial photography as means of photogrammetric recording of large archaeological sites. Based on the examples from Tunisia, as well as other parts of the world, Gai Jorayev provided substantial overview of recent rise of the use unmanned aerial vehicles in archaeology and their benefits. Following the main questions throughout the week, there also were short presentations on photographic techniques and overlapping photography. All 33 participants achieved excellent results during the week in developing technical skills in photogrammetric methods. 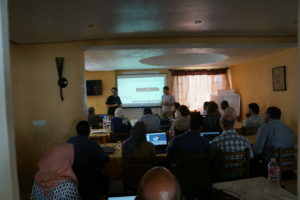 All of the participants are now able to independently plan and execute a photogrammetric survey project to fulfil different site management and monitoring needs, to create their own models, plans and image sets on their computers and to link these with other software packages. Participants to the training at the site of Iunca.